After live images and specs and more renders that went wild, Infinix Zero 4 X555 which was an eagerly-anticipated flagship from Infinix mobility is now available in all major stores in Nigeria like Slot, Konga, and Jumia. As expected, the major difference between these Zero 4 X555 and it’s Zero 4 Plus version is seen in the camera, RAM size, and battery. Infinix Mobility has a formidable track record of teasing its zero series, but if you are unfamiliar with the brand, that’s how they operate and it’s been working like a charm.If you are a fan of Infinix Mobility or have been following the brand, the “HERO,” “THENEXTHERO,” “ZERO2HERO” and the “HERO3LOGY” campaign, used in marketing the Infinix Zero 3, should be familiar. Infinix Zero 4 mobile features 4G LTE network for a fast Internet connection from anywhere. This Infinix Zero smartphone has a 16MP rear and 8MP front camera.The Infinix Zero 4 X555 smartphone makes everything seem super easy and manageable. It is equipped with a 1.3GHz Octa Core CORTEX processor and 3GB RAM that lets you navigate, open, run apps, and multitask at a superior speed without any lag. If you use two phones or find it difficult to manage your work and personal contacts, with dual SIM card slots of this phone, you can seamlessly search for and switch between contacts from the comforts of a single device. The Infinix Zero 4 is super fast and glitch free as it operates on a 64 bit Octa Core CORTEX processor with a clock speed of 1.3GHz. It also features a 3GB RAM that quickens the pace of the CPU every time you enter a multitasking mode or open a file. The phone gets its neat screen and highly interactive interface with the preinstalled Android 6.0 Marshmallow operating system. In all, this device is apt in handling the heaviest of files and giving you smooth operations for all activities. So you can play a fast paced game, watch a movie, or switch to online browsing without any delay from slow operating speed or lag. The Infinix X555 phone has a big 5.5inch screen that displays every content in rich and vibrant picture quality. 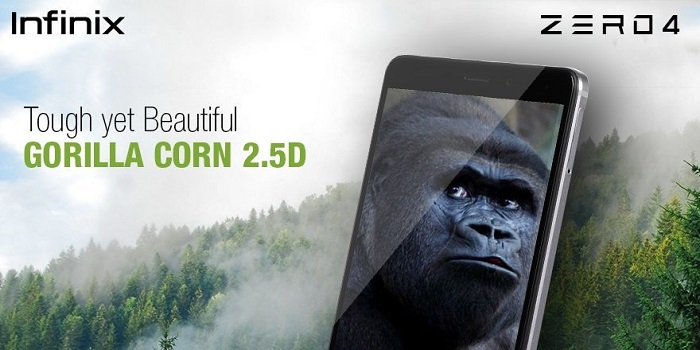 The screen is protected against scratches by a 2.5D TP third generation Corning Gorilla Glass. The phone is installed with a powerful 3200mAh battery that gets charged quickly with XCharge 3A PE plus 2.0 technology. And once fully charged, it provides amazing 300mins of voice calling, 80mins of video playback, 360mins of audio playback, and 70mins of gaming. With its integrated 32GB storage space, you can rely on this device to hold all your needed multimedia files comfortably. The Infinix Zero smartphone features a 16MP rear camera with laser sharp autofocus for brilliant and clear photos. With its fast focus and Pro Mode manual camera controls, you get detailed and accurate pictures in the blink of an eye. It features 4X Sharper Zoom that lets you capture far away objects in crisp and crystal clear picture quality. The phone also has an 8MP front camera with panoramic selfie functionality, f/2.2 lens, and front facing flash, which captures you and the background with bright, clear, and sharp details.